Common core, bilingual and English language learners: A resource for educators. Menken, K., Pérez Rosario, V., & Guzmán Valerio, L. (2018). Increasing multilingualism in schoolscapes: New scenery and language education policies. Linguistic Landscape, 4(2), 101-127. Menken, K. & Avni, S. (2017). Challenging linguistic purism in dual language bilingual education: A case study of Hebrew in a New York City public middle school. Annual Review of Applied Linguistics, 37, 185-202. Ascenzi-Moreno, L., Hesson, S., & Menken, K. (2016). School leadership along the trajectory from monolingual to multilingual. Language and Education, 30(3), 197-218. Menken, K. & Solorza, C. (2015). Principals as linchpins in bilingual education: The need for prepared school leaders. International Journal of Bilingual Education and Bilingualism, 18(6), 676-697. Menken, K. & Shohamy, E. (2015). Invited colloquium on negotiating the complexities of multilingual assessment, AAAL Conference 2014. Language Teaching, 48(3), 421-425. Flores, N., Kleyn, T., & Menken, K. (2015). Looking holistically in a climate of partiality: Identities of students labeled ‘long-term English language learners.’ Journal of Language, Identity, and Education, 14(2), 113-132. Menken, K., Hudson, T., & Leung, C. (2014). Symposium article: Language assessment in standards-based education reform. TESOL Quarterly, 48(3), 586-614. Menken, K. & Solorza, C. (2014). No child left bilingual: Accountability and the elimination of bilingual education programs in New York City schools. Educational Policy, 8(1), 96-125. Menken, K. & Solorza, C. (2013). Where have all the bilingual programs gone?! : Why prepared school leaders are essential for bilingual education. Journal of Multilingual Education Research, 4, 9-39. Menken, K. (2013). Restrictive language education policies and emergent bilingual youth: A perfect storm with imperfect outcomes. Theory into Practice, 52(3), 160-168. Koyama, J. & Menken, K. (2013). Emergent bilinguals: Framing students as statistical data? Bilingual Research Journal, 36(1), 82-99. Menken, K., Kleyn, T. & Chae, N. (2012, August). Spotlight on “long-term English language learners”: Characteristics and prior schooling experiences of an invisible population. International Multilingual Research Journal, 6(2), 121-142. Menken, K. (2011, March). From policy to practice in the multilingual apple: Bilingual education in New York City. Editorial Introduction. International Journal of Bilingual Education and Bilingualism, 14(2): 123-133. Menken, K. (2010, Spring). No Child Left Behind and English language learners: The challenges and consequences of high-stakes testing. Theory Into Practice, 49: 121-128. Menken, K. & Kleyn, T. (2010, July). The long-term impact of subtractive schooling in the educational experiences of secondary English language learners. International Journal of Bilingual Education and Bilingualism, 13(4), 399–417. Menken, K. (2009, March). ‘No child left behind’ and its effects on language policy. Annual Review of Applied Linguistics, 2009 (29), 103–117. Menken, K. (2008, September). Editorial introduction 7.3. Thematic issue “No Child Left Behind and U.S. language education policy.” Language Policy, 7(3), 191-199. Menken, K. (2006, Summer). Teaching to the test: How standardized testing promoted by No Child Left Behind impacts language policy, curriculum, and instruction for English language learners. Bilingual Research Journal, 30(2), 521-546. Menken, K. (2001, May/June). When all means all: Standards-based education reform and English-language learners. NABE News, 24(5), 4-7. Menken, K. (2000). What are the critical issues in wide-scale assessment of English language learners? NCBE Issue Brief No. 6,1-8. Washington, DC: NCBE. [Online]. Menken, K. & Look, K. (2000). Meeting the needs of linguistically and culturally diverse students. Schools in the Middle, February 2000, 20-25. Menken, K. & Sánchez, M. (2016). Afterword. In García, O. & Kleyn, T. (Eds. ), Translanguaging with multilingual students: Learning from classroom moments. New York: Routledge. Shohamy, E. & Menken, K. (2015). Language assessment: Past to present misuses and future possibilities. In W. Wright, S. Boun, & O. García (Eds. ), Handbook of bilingual and multilingual education. Hoboken, NJ: Wiley-Blackwell. Field, R. & Menken, K. (2015). What might the process of language education policy development look like at the district and school levels within the context of the Common Core State Standards? In Valdés, G., Menken, K., & Castro, M. (Eds. ), Common Core, Bilingual and English language learners: A resource for educators. Philadelphia, PA: Caslon. Menken, K. & Kleyn, T. (2015). What do teachers need to understand about the implications and challenges that CCSS and NGSS present for long-term ELLs/emergent bilinguals (LTELLs)? In Valdés, G., Menken, K., & Castro, M. (Eds. ), Common Core, Bilingual and English language learners: A resource for educators. Philadelphia, PA: Caslon. Menken, K. (2015). What have been the benefits and drawbacks of testing and accountability under No Child left Behind for ELLs/emergent bilinguals, and what are the implications of these for accountability under the Common Core State Standards? In Valdés, G., Menken, K., & Castro, M. (Eds. ), Common Core, Bilingual and English language learners: A resource for educators. Philadelphia, PA: Caslon. García, O. & Menken, K. (2015). Cultivating an ecology of multilingualism in schools: Building interindividuality of voices and ideologies. In B. Spolsky, O. Inbar & M. Tannenbaum (Eds. ), Challenges for language education and policy: Making space for people. New York: Routledge. Menken, K. (2013). Dis-Citizenship or opportunity? : The importance of language education policy for access and full participation of emergent bilinguals in the US. In Ramanathan, V. (Ed. ), Language policies and (dis)citizenship: Rights, access, pedagogies. Bristol, UK: Multilingual Matters. Avni, S., & Menken, K. (2012). Educating for Jewishness: The teaching and learning of Hebrew in day school education. In García, O., Zakharia, Z. & Octu, B. (Eds.). Bilingual community education and multilingualism. Bristol, UK: Multilingual Matters. Menken, K., Funk, A. & Kleyn, T. (with Ascenzi-Moreno, L., Chae, N. & Flores, N.). (2011). Teachers at the epicenter: Engagement and resistance in a biliteracy program for “Long-Term English Language Learners” in the U.S. In C. Hélot and M. Ó Laoire (Eds). Pedagogy of the possible: Language policy for the multilingual classroom. Bristol, UK: Multilingual Matters. Menken, K. (2009). Policy failures: No Child Left Behind and English language learners. In S. Groenke & A. Hatch (Eds. ), Critical pedagogy and teacher education in the neoliberal era: Small openings. Berlin, Germany: Springer. Menken, K. (2008). Language policy and social control. In J. González (Ed. ), Encyclopedia of bilingual education (pp. 452-455). Thousand Oaks, CA: SAGE Publications. Menken, K. (2008). No Child Left Behind Act of 2001, testing requirements. In J. González (Ed. ), Encyclopedia of bilingual education (pp. 604-607). Thousand Oaks, CA: SAGE Publications. Menken, K. (2008). High-Stakes Testing Effects. In J. González (Ed. ), Encyclopedia of bilingual education (pp. 350-353). Thousand Oaks, CA: SAGE Publications. Menken, K. (2007). High-stakes tests as de facto language policies in education. In E. Shohamy and N. Hornberger (Eds. ), Encyclopedia of language and education (pp. 401-414). Volume 7: Language testing and assessment. Netherlands: Kluwer. García, O. & Menken, K. (2006). The English of Latinos from a plurilingual transcultural angle: Implications for assessment and schools. In S. Nero (Ed. ), Dialects, Englishes, creoles, and education (pp. 167-184). Mahwah, NJ: Lawrence Erlbaum Associates. Menken, K. (2006). Historical overview of policies for English language learners. In R. Freeman & E. Hamayan (Eds. ), English Language Learners at school: A Guide for Administrators (pp. 1-5). Philadelphia, PA: Caslon Publishing. Menken, K. (2008, April). Review of Language policy: Hidden agendas and new approaches by Elana Shohamy. Current Issues in Language Planning 9(2), 231-234. Menken, K. (2006, January/February). Invited review of Leaving children behind: How “Texas-style” accountability fails Latino youth by Angela Valenzuela (Ed.). Language Learner 1(3), 22-23. Menken, K. (2017). Leadership in dual language bilingual education. White Paper. Washington, DC: Center for Applied Linguistics. Menken, K. (2012). Introduction. School leadership and bilingualism: A CUNY-NYSIEB guide for professional development. New York: City University of New York–New York State Initiative on Emergent Bilinguals (CUNY-NYSIEB). Menken, K. & Solorza, C. (2011, August). Factors in School Administrators’ Decisions about Educational Programming for Emergent Bilinguals. A report for the Division of Students with Disabilities and ELLs of the New York City Department of Education. Menken, K. (Ed.). (2011, March). From policy to practice in the multilingual apple: Bilingual education in New York City. Special issue guest editor. International Journal of Bilingual Education and Bilingualism, 14(2), March 2011. Menken, K., Kleyn, T., Ascenzi-Moreno, L., Chae, N., Flores, N., & Funk, A. (2009). Meeting the needs of long-term English language learners in high school, Phase II. A report for the Office of English Language Learners of the New York City Department of Education. Menken, K. & Shohamy, E. (Eds.) (2008, September). No Child Left Behind and U.S. language education policy. Guest Editor for a Thematic Issue of Language Policy 7(3), September 2008. Menken, K., Kleyn, T. & Chae, N. (2007). Meeting the needs of long-term English language learners in high school. A report for the Office of English Language Learners of the New York City Department of Education. Bartlett, L., Menken, K., Seghers, M. & Adely, F. (2003). Human development and language policy. Invited report for United Nations Development Programme, Human Development Report 2004. Pompa, D. & Menken, K. (2003). Appropriate inclusion of English language learners in accountability systems: A model system. Guidelines. Washington, DC: National Association for Bilingual Education & Education Commission of the States. Menken, K. (2001). Do the models fit? Towards comprehensive school reform for English language learners. NCCSR/NCBE Issue Brief. Washington, DC: National Clearinghouse for Comprehensive School Reform and the National Clearinghouse for Bilingual Education. [Online]. Menken, K. & Look, K. (2000). Making chances for linguistically and culturally diverse students. The Education Digest 65(8), 14-19. Menken, K. (2000). 1) How does standards-based reform affect English language learners? 2) Models that fit: Comprehensive school reform and English language learners 3) What are the critical issues in wide-scale assessment of English language learners? 4) Ensuring English language learners’ success: Balancing teacher quantity with quality. What is the reform agenda for our English language learners? : A compilation of essays by the National Clearinghouse for Bilingual Education. Washington, DC: NCBE. Prepared for the U.S. Department of Education, Office of Bilingual Education and Minority Languages Affairs. Antunez, B. & Menken, K. (2000). An overview of the preparation and certification of teachers working with LEP students. Washington, DC: NCBE. [Online]. Useem, E. & Menken, K. (1998). Findings from a survey of student teachers in the School District of Philadelphia. Philadelphia, PA: Philadelphia Education Fund. Burke, A. (2011). A Review of “English learners left behind: Standardized testing as Language Policy.” Language Testing, 28(3), 421-424. Cassiodorus. (2009). Kate Menken’s “English Learners Left Behind.” Daily Kos, 7/17/08. Click here for PDF version. Gilliland, B. (2009). Review of English Learners Left Behind: Standardized Testing as Language Policy. Education Review, 4/15/09. Click here for PDF version. Gutstein, L. (2011). 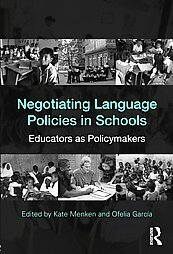 Negotiating Language Policies in Schools: Educators as Policymakers – Edited by Kate Menken and Ofelia García. Anthropology & Education Quarterly, 42(4), 440–441. Hult, F. (2013). Review of Negotiating language policies in schools: Educators as policymakers. International Journal of the Sociology of Language, 2013(219), 141-144. Sánchez, I. (2012). Book Review. Negotiating language policies in schools: educators as policymakers. International Journal of Bilingual Education and Bilingualism, 16(1), 119-121. Sherris, A. (2011). A Review of “Negotiating language policies in schools: educators as policymakers.” Language and Education, 25(2), 177-180. Snow, P. (2010). Review of Negotiating Language Policies in Schools: Educators as Policymakers. Teachers College Record, 10/4/10. Wagner, E. (2009). A Review of “English learners left behind: standardized testing as language policy.” International Journal of Bilingual Education and Bilingualism. 12(6), 721-737. Wong, P. (2008). Review of English Learners Left Behind. Teachers College Record, 5/30/08. Wright, W. (2012) Review of Negotiating Language Policies in Schools: Educators as Policymakers by Menken, Kate, & García, Ofelia. Education Review, 15 (2/12/12).